DEEPWATER UNKNOWNS -TWO YEARS AFTER | Gulf Oil Spill Solutions Now! As of April 20, 2012âthe 2nd Anniversary of the Deepwater Horizon Disaster — we have a backdrop of recently published scientific studies[i] indicating sick and dying dolphins, coral and other sea life; bacteria laden tar balls washing onto beaches, an intoxicated Gulf food chain and a Macondo geohazard risk zone over a mile below the surface that some experts say has the potential of releasing toxic gas and oil into the Gulf of Mexico for the next 25 years.Â Behind this deepwater curtain, there are still many unknowns about the BP Oil Spill events and response. While a federal trial is still pending and BP settlement talks with the Department of Justice and other stakeholders are on-going, the public are still waiting for a revelation to settle the many open questions associated with the largest oil spill in history. One Geo Hazard Specialist[ii] with a team of insider whistleblowers have brought to the surface answers to a number ofÂ these deepwater unknowns having spent the past two years engaged in forensic studies and analysis of disaster records.Â The Gulf Rescue Alliance (GRA) compiled some of this material into a Briefing Package for Congress and the Attorney Generals of the states of Alabama and Louisiana last month hoping to draw attention to factors they believe might be missed in trial examinations. The material revealed a hidden 3rd Macondo well that was not the celebrated final capped well (Well A) seen on TV screens across the country, but rather, a well 720ft away from that pictured well. 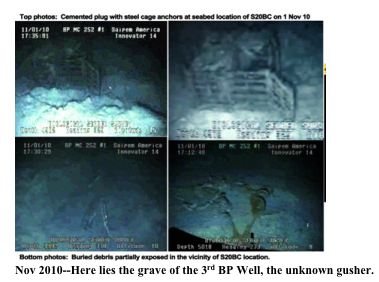 The actual well (visible at 1:17hrs on this ROV Video[iii]) shows a completely different situation from that described and reported to congressional investigators and the public.Â Contrary to published records on the event, one sees a well with its blowout preventer (BOP), well bore and casing scattered in pieces on the seabed floor which industry experts say could only have resulted from a powerful explosion that left a gapping oil gushing crater. 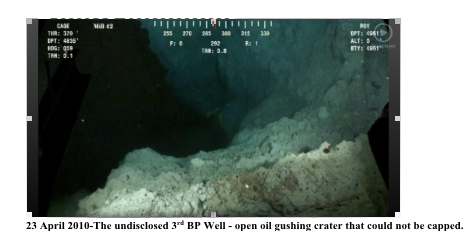 23 April 2010-The undisclosed 3rd BP Well – open oil gushing crater that could not be capped. Nov 2010–Here lies the grave of the 3rd BP Well, the unknown gusher. 5000 ft below seabed level and never hit the reservoir to release a flow. Â No one knows why this capping event in a different location [substantiated by BP ROV location coordinates] deferred attention from the 3rd well.Â There are still concerns that the reservoirâs gases and high pressure took a detour through cracks and fissures and was not, in fact, laid to rest but instead âmorphed into a âmultiple-headed hydraâ deep beneath the seafloor that is even more difficult to killâ. Two years after, the Macondo well location is still off limits like a taped off crime scene. However BP has had free access to the area while outside investigators are not permitted to enter.Â After more than a year of grouting, patching up and cleaning up the seabed around the Macondo wells, we may not ever know what really happened.Â Liken this to letting a murderer spend a month to clean up the crime scene before sending in the CSI team.Â Some say the information needed to answer so many questions may end up staying buried under the tombstone forever. Despite reports (as recent as Mar 2012) that new oil slicks are still appearing in the vicinity, BP, the Coast Guard, and NOAA have indicated new sightings of oil were caused by ânatural seepsâ and not the Macondo well (s). 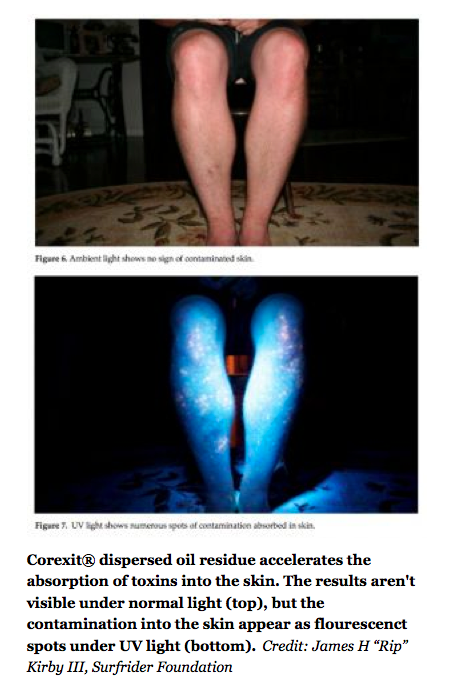 Â But why then is the controversial toxic dispersant Corexit still foaming up on beaches along with this ânatural seeping oilâ? Â Residents continue to report oil and dispersant in their waters.Â Investigative Journalist Dahr Jamail who has reported extensively on the BP spill reported on a 25 mile long slick he witnessed while flying over the Gulf in March, 2012.
c. the sub-seabed underground erosion in the vicinity of the shelf edge undermining the slope stability with possible tsunami-generating, giant, submarine landslides. There is no question that the oil seepages, gas columns, fissures and blowout craters in the seafloor around the Macondo wellhead, observed from the ROV videos, have been the direct result of indiscriminate drilling, grouting, injection of dispersant and other undisclosed recovery activitiesâ said Lim. Given this frightening forecast of a Macondo Reservoir out of control, how will the residents and life in the Gulf be affected?Â With the clean up phase promoted by BP and the EPA as over, emphasis on reducing US oil dependence and everyone standing in line for ârestoration phaseâ funds, it seems that continued leaking oil is not a subject of interest.Â Moreover, with 73 newly issued Department of Interior deep water drilling permits and absolutely no change in the Environmental Protection Agency (EPA) stance on Oil Spill Response/Clean up regulations, the prospect of another disaster looms. Two years after– oil spill clean-up âtechnologyâ is apparently not about effectiveness but market dominance–Exxon invented/Nalco manufactured Corexit dispersant is the ONLY product with EPA/DOI preapproval since 1994.Â And, preapproval is a key word in oil spill response-since no companies will stockpile for emergency use Â a product in the quantities necessary for a large scale disaster unless pre-approval exists. Â Many products have been listed on the EPAâs official National Contingency Plan (NCP) for oil spill cleanup list but that doesnât mean they will be allowed to be used on US navigable waters when there is a spill.Â They still have to go through a request process.Â In the past 18 years, no other product but Corexit has ever been approved, despite being inferior in results, more toxic, and more expensive than many of the other products on the list.Â This has effectively supported and protected a monopoly owned by big oil companies, by setting the situation up in such a way that no other products can compete. Moreover, the preapproval hurdle has prevented technologically superior and environmentally safe clean up applications from being usedâthe EPAâs own bureaucratic web has blind sighted itself off track and in effect forced residents and sea life into enduring exposure to horribly toxic chemical concentrations through the use of these preapproved dispersants in their living environments. One such company with a 23 year history battling with the EPA to obtain preapproval is the OSEI Corporation.Â Despite its product Oil Spill Eater II (OSE II) being listed on the NCP since 1996 with a record of cleaning up more than 18,000 spills, and rigorous scientific testing that proves it to be an effective and completely non-toxic alternative to dispersants â the EPA has refused requests from Gulf state officials and even BP to permit its use on GOM waters. âThe toxic dispersants add absolutely nothing to EFFECTIVE RESPONSE. There is no scientific basis for it, and their use violates The Clean Water Act, EPAâs charter and common sense.Â All stakeholders continue doing the same thing over and over again, with the exact same negative outcomeâalthough the EPA calls the toxins in dispersantsâ reasonable tradeoffsâ, Corexit and dispersants like it, have a horrible track recordâ, said Steven Pedigo, CEO OSEI. Corexitâs label clearly states it can cause kidney failure and death and the MSDS (Material Safety Data Sheet) specifically warns, âDo not contaminate surface waterâ with it.Â Additionally, toxicity testing in regards to marine species shows little tolerance by all forms of sea life; thus, applying it on spills as a preferred response method increases the toxicity of the spilled oil on which it is used,â Pedigo emphasized. Dispersants are gaining a justifiable reputation for exacerbating an ocean spillâs problems by sinking the oil into the water column where 60% of marine species live, adversely effecting their ability to survive.Â Fears now exist that the entire food chain may be threatened by large quantities of Corexit dispersant used on the Gulf spill.Â One less known fact is that (per US EPA official guidelines) for a dispersant to be deemed effective, it must sink 45% of the oil within 30 minutes.Â Â Thatâs it… nothing else mentioned in the criteria and no clean up standard is mandated.Â In other words, the imagined solution to the problem of oil hitting shores or adhering to wildlife is not a solution at all–it just moves the problem to a secondary area creating further complications.Â Toxic chemical dispersant response has proven to just create more natural resource damages, adverse litigation and generally increase spill related costs. (See Study) . Tiny globs of it, mingled with the chemical dispersant that was supposed to break it up, have settled into the shallows, mingling with the shells, he said. When Kirby shines his light across the legs of a grad student who’d been in the water and showered, it shows orange blotches where the globs still stick to his skin.Â Without the UV light, the skin just looks normal. In Nov of 2011, the US EPA requested a meeting with CEO OSEI Corporation, Steven Pedigo after receiving 373 pages of scientific documents showing that OSEIâs Oil Spill Eater II would be a non-toxic alternative to dispersants and solution to the problems existing in the Gulf.Â This information included citing EPAâs own requested use of OSE IIÂ®Â on the Osage Indian Reservation in 2003 and a presentation attended by several EPA officials where they were given first hand reports and scientific documentation on results with OSE IIÂ on 100âs of spill clean ups performed by the US Navy in San Diego Bay, California, USA. Concerned citizens, including State Senator AG Crowe of LA who authored a petition to ban the use of dispersants find it hard to believe that EPA and NOAA scientists continue to claim there isnât yet enough experience and scientific tracking to understand the effects of the use of dispersants. [v] However these same dispersants have been used for the past 25 years on oil spills, notably Exxon Valdez, Torre Canyon Spill-Santa Barbara, the Mega Borg Spill, San Francisco South Korea Tanker spill and countless other spills around the world.Â A study of the Ixtoc spill showed negative effects lingering 30 years later.Â The track record has clearly been dismal and there is ample documentation on sick and dying responders and millions of dead species of the sea, water ways and shores. âNow we have the Deepwater Horizon accumulating reports of tens of thousands of sick Gulf residents and responders, dolphins and other life suffering from an overdose of the by-product of these EPA enforced clean up protocols.Â What is really sad is that we canât get approval to apply a proven bioremediation product (OSE II) to truly clean it up.Â Corexit plus MC252 DWH Oil is a cancer causing combination of chemical compounds which is quite contrary to the premise and purpose of the Clean Water Act,â said a Gulf Rescue Alliance spokesperson Susan Aarde. Given that the amount of dispersants applied in the Gulf was unprecedented–1.84 million gallons, both on the surface and injected 5000ft down â the affects are unknown and still being studied. In a word, two years after, we have â new deepwater drilling permits being issued as part of a campaign to reduce foreign oil dependency, along with Cuba and other US Gulf oil regions stepping up their deep water productionâunfortunately the SAME spill countermeasure plans remain in place and advanced technology offering safer and more effective solutions remains under an EPA blockade. CLEANING UP THE SUNKEN OIL â WHY DOESNâT THAT DESERVE EMERGENCY RESPONSE? Two years after some of the larger environmental organizations are engaged in conducting much needed studies of the Gulf, maintaining a lobby presence for regulatory legislation and/or bringing the responsible parties to justice.Â A most recent study published by Surfrider Foundation, points out with absolute clarity that the BP spill response using dispersants was wholly inadequate.Â While the bulk of attention is riveted on the horrible effects and who is at fault, The Earth Organization (TEO), founded by renowned conservationist Â Lawrence Anthony who recently passed away, has been working to get the Gulfâs waters cleaned up as its primary focus. The Earth Organization produced a film to promoted non-toxic solutions entitled: The Crisis in the Gulf released last year. Interviewed in the film are scientists, fishermen, government officials and OSE IIâs inventor Steven Pedigo, as an example of one effective solution that the EPA has dedicatedly blocked despite all scientific indications to the contrary. With little support from the EPA over their 23 year history, the OSEI Corporation (which has preapproval for its bioremediation product in India, Greece, Nigeria and South Korea), just sent 12 certified letter submissions to the Department of Interior, Bureau of Safety and Environmental Enforcement (BSEE) urging preapproval of OSE II for cleaning up the Gulf and inclusion in the Spill Countermeasure Plan as well as for use in regard to all the permitting,Â approvals and licensing in all BSEE districts. In June of 2011 the Department of Interior released a test conducted on the effectiveness of dispersants compared to the OSE II product finding its ability to actually clean up a spill (not sink it) was exceptional. [vi] âSince the EPA did not seem interested in finding an alternative for toxic dispersants, we decided to seek preapproval through the DOI since they themselves preformed the testing showing dispersants to be questionable in truly remediating a spillâ, commented Pedigo. In a conference call today between EPA Regional Response Team 6 Officials (Steve Mason, Jim Staves, Ragan Â Boyles) and OSEI CEO who requested the use of OSE II on the recent Shell Oil Spill in the Gulf, no consensus could be reached.Â According to Pedigo, who has been demanding an in-writing response to his formal pre-approval request from RRT 6 for more than a year, one of the conference call participantsâ said: âwe cannot come up with a reason not to use OSE IIâ. HOW WILL WE EVER KNOW THE TRUTH UNLESS A SURVEY BY INDEPENDENT GEOHAZARD SPECIALISTS IS CONDUCTED? A concerned citizen, Rhea Aker, conducted her own study released on You Tube in Jan 2012 entitled: Proof BPâs Well Is Not Capped as They Say It Is. The posting has a link to a petition to demand an independent ROV survey of the seabed floor. A seafloor survey conducted by BP (using the various multi-beam sonar and sub-bottom profiling techniques) was conducted 15 months later after repeated sightings of new oil.Â Such a seafloor survey should have been conducted as soon as possible to gather more information on the causes of the disaster and confirm no further leakage.Â âThis belated seafloor survey is nothing more than a carefully choreographed survey designed to show the world that the Macondo Disaster had ended and the new oil spills are nothing more than natural random seeps,â said Lim. The undisclosed 3rd Macondo well reported as finally sealed in Sept 2010 was drilled without a permit which is illegal.Â It is this well that was connected to DWH that had the blowout. Nearby Well A and Well B, which had MMS permits, had to be abandoned and capped earlier than the blowout due to geohazard risks. Congressional Records, MMS records and BP testimony omit the existence of a 3rd well and official public statements asserted there was only one wellâthe one that was reportedly capped. Evidently, BP tried to cover up the fact of 3 wells by calling them â3 leaksâ in the fallen riser. 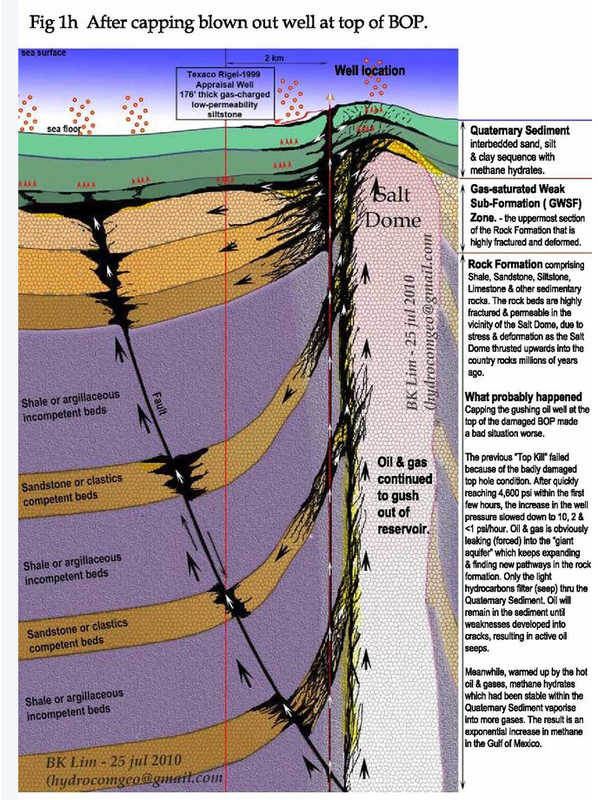 The original blowout, killing 11 people that occurred on the 20th of April did not result in oil leaking from the well.Â And yet, no one has questioned, or required an explanation for the additional unexplained explosions that triggered the release of oil into the Gulfâoil that did not begin flowing until the 22nd of April.Â Per Geohazard expert BK Lim, the only way that a 5-story high and multi-tonâd BOP could have been thrown over 70 feet away from its original position is if detonation of large magnitude was deliberately set. Industry experts speculate that a small nuclear device was placed at the bottom of the well at 18,000 ft in a last ditch effort to stop the flow.Â But instead, this produced an even more dangerous environment of fractures, faults and fissures that can never be capped. the most adverse geological conditions. The most prominent submarine physiographic trough in the northern Gulf of Mexico is the Mississippi Canyon. This submarine trough has an average width of 8 km., length of 120 km., and bathymetric relief of 300m. Its origin has generally been attributed to channel entrenchment of the Mississippi River during low stands of sea level and erosion of the more distal parts by turbidity currents or submarine gravity flows. In the last two years, a dense, high-resolution seismic and side-scan sonar grid (305 m.), together with deep borings utilized to obtain samples for C-14 dating, has been used to establish a time-stratigraphic framework and origin for this feature. Nine horizons, chosen from borings and dated by C-14 and paleontologic methods, have been traced laterally on the seismic lines. These horizons range in age from Illinoian (400,000 years B.P.) to late Holocene (3,500 years B.P.). During the interval from Illinoian to late Pleistocene (25,000-27,000 years B.P. ), the Mississippi River deposited a series of fluvial and deltaic deposits of approximately 1,000 m. There is no evidence that a submarine canyon existed in the vicinity of the present feature during this time interval. Approximately 25,000 years ago, a C-14-dated horizon was truncated by the initial formation of the submarine canyon. Samples dated by C-14, obtained near the base of the canyon fill, show that by 20,000 years B.P.,canyon fill had commenced. Thus, this major submarine trough had, at most, 7,000 years in which to remove 1,500 to 2,000 km.3 of material. It is highly probable, therefore, that the canyon originated from massive shelf-edge slope failure on an unstable continental margin. A series of successive failures, each one creating an upslope instability that triggered the next failure, caused an elongate trough to form that excavated the canyon to a depth of 1,220 m. below present sea level. Once the canyon has formed, its steep side walls continued to be unstable and sediments slumped into the canyon axis, forming the initial canyon fill. This phase is well documented: the lowermost sediment fill is composed of displaced material similar to that now found on the canyon rim. Large scars from side-wall failures can also be easily mapped on the seismic data. From 20,000 years to approximately 5,000 years B.P., a series of late Wisconsin and Holocene delta lobes formed and were responsible for the remainder of the fill of the canyon. During the past 5,000 years only a thin deep-water pelagic drape has been deposited within the canyon. Maps have been constructed that depict the various horizons, and the geometry of these horizons verify this mode of formation. [v] http://articles.latimes.com/2010/sep/04/science/la-sci-dispersants-20100905 Mervin Fingas, a retired scientist with the Canadian government, said that of roughly 40 biodegradability studies he surveyed between 1997 and 2008, about 60% said dispersant retarded growth of oil-eating microbes and 15% reported no effect. The remaining 25% noted a positive effect. The primary purpose of dispersants is to move oil away from surface-dwelling marine life. In the case of the BP well blowout, because the application was deep under the sea, much of the oil never rose to the surface â which means it went somewhere else, said Robert Diaz, a marine scientist at the College of William and Mary in Williamsburg, Va.
[vi] The US department of Interior, through solicitation number M08PS00094, award number: M09PC002, through their Bureau of Ocean Energy Management and Enforcement (BOEMRE), (previously Mineral Management Service) paid for a study of dielectric oilâs ability to be dispersed, skimmed and bio remediated. This bioremediation effectiveness testing protocol (CFR, 1999) was designed to determine oilâs ability to naturally biodegrade by quantifying changes in the oil composition resulting from biodegradation.